Can you tell the difference between the damselfly and dragonfly? Both tend to fill us with wonder, and the facts about these insects are just as fascinating. Bring the kids to Damsels and Dragons at the Susan Hambley Nature Center to take a closer look at the intricate world of these creatures. This unique event is held from July 13 to July 15, and invites you to explore the lives of these jewel-like insects up close and in-depth. Learning should always be this fun! Though somewhat similar, these two creatures have distinctive differences. Damselflies have thinner bodies and less prominent eyes than dragonflies. They have two pairs of wings that tend to be of the same size. Dragonflies also have two pairs of wings, although the upper set is larger than the lower. When at rest, dragonfly wings remain open, while damselflies tend to neatly hold their wings down their backs when they land. According to the University of Florida, dragonflies and damselflies are among the most popular kinds of insects with both amateur and professional enthusiasts. This isn’t so surprising — it’s always delightful to see them flitting about ponds, streams and backyard retreats. There are so many other amazing facts to learn about dragonflies and damselflies. For instance, certain species molt up to 17 times before reaching adulthood. That’s a lot of molting! 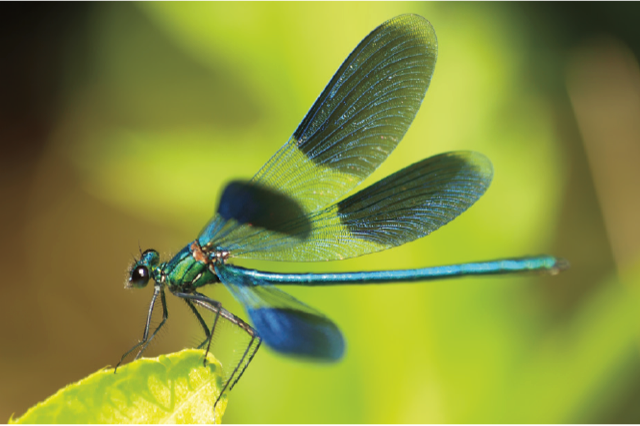 Ohio is home to more than 150 documented species of damselflies and dragonflies. Even though these insects seem abundant in our area, it’s important to note that some species are endangered. Researchers continue to look for new species, and work towards learning more about how we can conserve those that are threatened. You can find out more about this important work at the event. Damsels and Dragons is open to people of all ages. It’s also totally free! No need to register or reserve a spot — just come ready to learn and have fun. There will be dragonfly- and damselfly-themed games and crafts, and lots of other activities to give you a truly hands-on learning experience. The event is organized by the Medina County Park District. Located in Brunswick Lake City Park, the Susan Hambley Nature Center is surrounded by unspoiled wilderness and features 200-year-old tree specimens. After you get your fill of damselflies and dragonflies, stick around for a bike ride or walk along the lush Brunswick Lake Trail, which crosses through wetlands and floodplains.